CMANO has been updated to version 1.14.2. • FIXED: Steam client running under Windows 7/8 may fail to properly initialize. Command LIVE: Commonwealth Collision has been announced! Read the analysis below to get prepared for what is coming! • Playable as the India-UK or Pakistan-China alliances. • Battle with or against a fleet of multiple aircraft carriers that includes the brand-new HMS Queen Elizabeth and INS Vikrant, along with the Type 45 destroyer. • Attack or defend a target set that includes seaport facilities, a deployed brigade, and even an admiral in his personal aircraft. • Coordinate the efforts of units that vary wildly in capability. Each side has a mixture of western and eastern platforms that range from fresh and untested to old and obsolete in terms of individual quality. Knowing the strengths and limits of each one is key to victory. • Control such potential game changers as the CM-400AKG anti-ship missile, F-35 stealth fighter, Astute-class submarine, and Soar Dragon high-altitude drone. • Command a force with fewer resources than a Nimitz CSG or Backfire regiment, making intelligent planning and asset management necessary. Command LIVE: Commonwealth Collision out on May 10th! Command LIVE: Commonwealth Collision will be released on May 10th! - Playable as the India-UK or Pakistan-China alliances. - Battle with or against a fleet of multiple aircraft carriers that includes the brand-new HMS Queen Elizabeth and INS Vikrant, along with the Type 45 destroyer. - Attack or defend a target set that includes seaport facilities, a deployed brigade, and even an admiral in his personal aircraft. - Coordinate the efforts of units that vary wildly in capability. Each side has a mixture of western and eastern platforms that range from fresh and untested to old and obsolete in terms of individual quality. Knowing the strengths and limits of each one is key to victory. - Control such potential game changers as the CM-400AKG anti-ship missile, F-35 stealth fighter, Astute-class submarine, and Soar Dragon high-altitude drone. - Command a force with fewer resources than a Nimitz CSG or Backfire regiment, making intelligent planning and asset management necessary. Command LIVE: Commonwealth Collision the eighth instalment in the Command LIVE series, has been released! This new episode explores a scenario in which the supremacy of carriers in modern naval conflicts will be put to a decisive test! • FIXED: Lua bug that occurs on 1% of intel updates on "The Enemy Below"
- Positioned Group/Mission to top of nodes. • [Lua] Added property "DesiredHeading" on Lua ActiveUnit wrapper and on AddUnit/SetUnit parameters (This solves the issue where static facilities placed via Lua will always rotate to North even if explicitly placed with another heading). • [Lua] Added method GetBuildNumber that returns the current exe build version. Scen authors can use this info to alter Lua logic depending on feature availability. • [Lua] Added method "SE_UpdateUnitCargo"
• SBR: Added any unit damage to the delta template. Update to 1.14.3 which went live together with Commonwealth Collision. * Includes updated terrain elevation data for the Chinese artificial reefs/islands. * Includes the v474 versions of the DB3000 and CWDB databases. * Includes updated versions of "Commonwealth Collision" and "Black Gold Blitz" rebuilt with DB3000 v474. SirAndrew's tutoprials now available for all! With SirAndrew's kind permission, his new tutorials for Command are now available to all CMANO users! (Until now only owners of the full game could use them). Unzip to your [CMANO]\Scenarios\Tutorials folder to use them. To apply: Unzip into your existing CMANO installation folder. (This update should also become available through Steam and Matrix-Updater after a few days). * Includes the v475 update for the DB3000 database. * Significant DB3000 database update: Added discrete sensors for submarine periscopes & masts, including 50+ periscope and photonics mast types and components; Mk1 Eyeball is now only available when submarines are surfaced. CMANO 1.14.4 update is out - Gurka inside! Excellent news! CMANO 1.14.4 update has been released! For the first time, UK can deploy its fearsome Gurka as infantry unit! 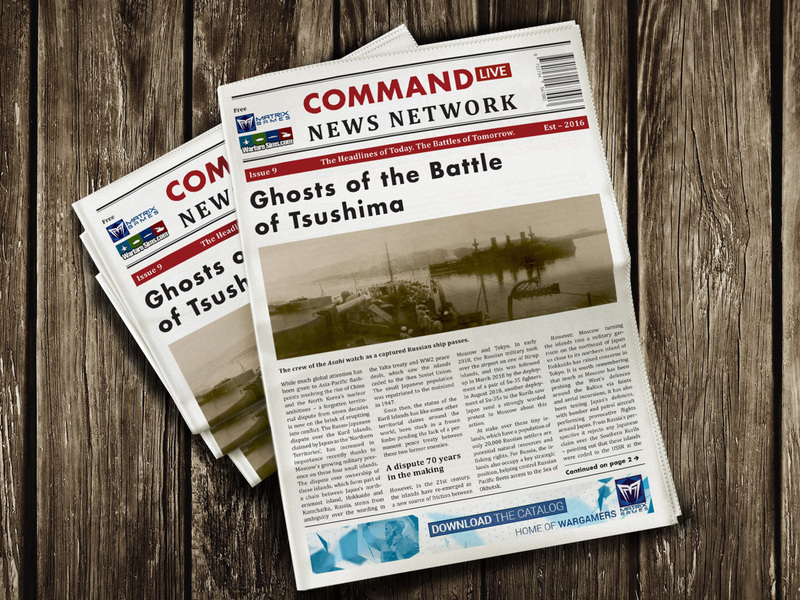 Command LIVE: Kuril Sunrise out on October 11th! Recent frictions over the Kuril Islands seem to have bolstered the extremists in Tokyo and Moscow alike and now Russian and Japanese forces are mobilizing! Command LIVE: Kuril Sunrise will be released on October 11th! CMANO has been updated to version v1.14.5! • Fixed: Unload cargo not transferrring from target. • Includes support for the new Command-LIVE scenario "Kuril Sunrise". • Includes a full import .inst) set of Italian cities, installations and units by Roberto Mezzi (Roby7979). The populist wave that has swept across the world has reached Japan. With a jittery economy and scandals in the previous government on the minds of the public the government that emerges following a set of snap elections is more nationalist and populist than ever. The new prime minister has set his eyes on the long-disputed Kuril Islands, repeatedly claiming them for Tokyo in numerous speeches. The JGSDF has traditionally been concentrated in Hokkaido already, but airborne and amphibious units have moved there, ostensibly for exercises. The Russians, familiar with that excuse to concentrate forces, have become more suspicious than ever. Not helping the situation is raucous demonstrators on both sides sailing towards either the Kuriles or Hokkaido in small boats. Several have been killed and dozens more detained. The Russians have been slipping troops in, but an improvised convoy has been readied at Petropavlovsk-Kamchatsky to carry much heavier forces to Kunashir and Iturup. Should it reach the islands safely, the Japanese goal of taking them without excessive casualties will be impossible. On the other hand, if it's sunk, the Kuriles are Japan's for the taking. The stakes are thus extremely high. Due to the (previously) anti-invasion nature of the JSDF and the traditional Soviet/Russian defensive doctrine at sea, both sides have an impressive array of sea denial weapons. The question is which shall prove superior? • Playable as Russia or Japan. • 21st Century convoy warfare. Using advanced aircraft, ships, and submarines, face the challenge of either escorting or attacking a convoy of civilian ferries. Which previous tactics will work and which ones will not in a new era? • Control advanced submarines. The nuclear vs. diesel dispute is on as the Yasen and Akula II submarines on the Russian side face the Soryu and Oyashio SSKs on the Japanese side. The strengths and weaknesses of both types are on display. • Fight the air battle with upgraded F-15s and Su-27s alongside classics like the F-4 and MiG-29. • Plan carefully. Each side has its own technological or logistical weakness the other can exploit. - Units firing AAW ARH weapons (e.g. AMRAAM) must now actively detect the target on their own radar before being able to fire the weapon (ie. it's no longer enough to receive offboard contact from e.g. AWACS and fire based purely on that). This makes it much more challenging to employ AMRAAM-class weapons against stealthy targets or in a heavy-OECM environment. - After launching an AMRAAM-class weapon, the unit must still keep detecting the contact in order to provide mid-course guidance to the missile. If radar contact is lost for more than 5 seconds, the missile goes into a "blind" state and flies stright ahead (similar to SARH weapons who lose guidance). (Appropriate AI/EMCON logic has been added to encourage this). Note that CEC-capable weapons can still be launched and mid-guided by a suitable outside datalink-parent platform, as before. * FIXED: Wrong tab-key order on controls on "Edit AC"